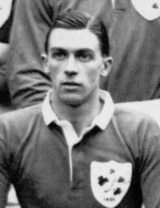 Stephenson won his first cap in 1920 against France to complete a remarkable rise from Queen's University's third team to international selection in just a few months. Once there he was not to be shifted for a decade, missing only a single match through injury, against Scotland in 1929, as he piled up totals of 42 caps and 89 points, making him the leading cap-winner and points-scorer in international history when he retired. Opinion as to whether his talent matched those formidable statistics varied. Welsh writer Townsend Collins had no doubts, noting 'quickness of foot, swiftness and grace, and the beauty of a deceptive swerve, he played for his fellows, he made openings and gave his passes with the accuracy and judgment of a master. He was a lovely kick and…was magnificent in defence. In many a game he was a rock against which the waves of attack broke in vain". Neither the Englishman E.H.D Sewell nor Stephenson's compatriot H.J.Harland questioned his quality in defence. But Sewell reckoned that 'his wings seldom scored a try that mattered - in my seeing' while Harland, pointing to his devastating displays for Queen's, reckoned a mystery in 'his inability to reproduce more of that brilliance in international struggles'. Yet his 14 tries remained an Irish record until broken by Brendan Mullin in 1991 and his wings, who included his older brother Henry, crossed 13 times while he was playing centre, against the 11 scored by players on the other wing. Certainly the Irish selectors felt no urge to drop him, and evidently regretted that his medical career took him to London, where he was to live until his death in 1970, to work as a psychiatrist. His records were also to prove durable - he was the leading points-scorer in all international rugby until overtaken by Jean Prat in 1952 and his caps record survived until Ken Jones won his 43rd in 1957. Jack Kyle took his Irish appearances record a year later, and the points record lasted until Tom Kiernan reached 90 points in 1968.